We are ready to kick off week 6 of this NFL season with a do or die game on Thursday night football. The first game of this week will feature the Philadelphia Eagles who are desperately trying to bounce back from their first back to back loss since week 15 of the 2016 season. On the other side of the field, the New York Giants who were expected to have a bounce-back year this season, have only won 1 game this season and really need this win at home to try and turn things around. 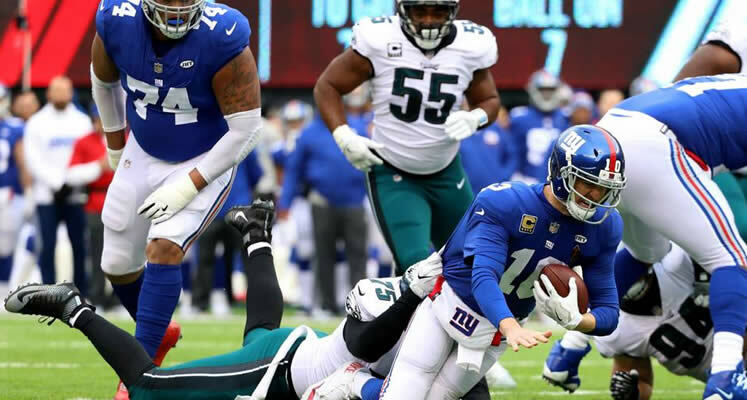 Although neither team is living up to fan expectations, the Eagles have a clear advantage in this matchup having won seven of the last eight games played against the Giants. Will that winning streak continues, or will Philly drop yet another game? The Eagles defense has all but disappeared this season, during their best moments they are still just a shell of what they were last season. They are allowing 25.3 points on losing games not to mention that their passing defense been squashed lately. The one saving grace the Eagles have is their offense now that Carlson Wentz is back. Wentz has surpassed the 300-yard passing mark, and he is also moving around better than expected. But, even this doesn’t seem to be enough; they seem unable to convert on third down, stats show they have only converted 13 out of their 38 third-down attempts, disappointing is an understatement. This brings us to the question, do the Philadelphia Eagles deserve to be a 3-point favorite in this game? Let’s see the reasoning behind this. The Giants offense continues to struggle, even if Eli Manning managed to surpass the 300 passing yards in a game for the first time this season against the Panthers, but, just like the Eagles third down conversions seem to be their Achilles heel, going 0-7 in that very same game. Defensively the Giants are in a rut, they are allowing 124.4 yards per game on the ground with an average of 4.6 yards per carry, not the worst in the NFL but certainly nothing to brag about. The only hope New York has of hurting the Eagles offense is with their passing defense. They have been the one good consistent thing the Giants have had in their previous 5 games, allowing an average of 237 passing yards per game. Against the Eagles however, for the Giants pass defense to be effective, their strategy should be to force Wentz to become a pocket passer, considering how disappointing the Eagles defense has been this season, this doesn’t seem too farfetched, and if the Giants succeed Philly might be staring at a humiliating third loss in a row. Picking the winner of this match won’t be easy, both teams are disappointing this year, but, there is a good chance for agents to make money on the total according to a spokesman from www.AcePerHead.com. The total for the game right now is at 44 which might seem low considering that Thursday Night games this season have averaged 51.2 points, and when these two teams face each other their average combined score is 54.6 points. Players will look at those stats and think they have it made by betting the over, however, given the status of both team’s offense, it is very likely the game will go under.